In addition to the resistive method, the capacitive measurement principle, above all, established and proved itself as a standard in the past. For this principle, the sensor element is built out of a capacitor. The dielectric is a polymer which absorbs or releases water proportional to the relative environmental humidity, and thus changes the capacitance of the capacitor. This change in capacitance can be measured by an electronic circuit. This allows the relative air humidity to be determined. 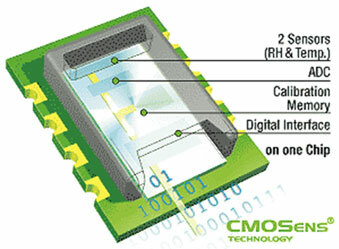 For humidity sensors with CMOSens® technology, a "micro-machined" finger electrode system with different protective and polymer cover layers forms the capacitance for the sensor chip, and, in addition to providing the sensor property, simultaneously protects the sensor from interference in ways previously not achieved. Total coverage with condensation or even immersion in liquid present no problems whatsoever. Over two years of hardness tests have already shown this result. The signal amplification near the sensor allows the polymer layers to be optimized not for the signal strengths, but rather for long-term stability, which is significant for numerous applications. The analog-to-digital conversion, which is also performed "in place," makes the signal extremely insensitive to noise. A checksum generated by the chip itself is used for additional reliability. Last but not least, the calibration data loaded on the sensor chip guarantees that Sensirion humidity sensors have identical specifications and thus they can be replaced 100%. Other obvious advantages are the very short response times (4 sec at 1/e), high precision (±2% to ±5% according to configuration), as well as very low power consumption (< 3mA standby).